Having established its brand in the security industry, Fawcetts diversified into electronic security solutions 2009. A wide range of products are available for differing environments. Systems can be designed to meet individual budgets. Alarm and panic systems can be connected by radio link to a Fawcett control room. This will facilitate the attendance of a Fawcett Reaction team in the event that the system is activated. Reaction teams are specially trained for this sensitive and high-risk duty. Vehicles are specially equipped with various tools to ensure that the team is able to respond to any eventuality. Labour Management Technology comes in the form of a well established American brand, in which time and attendance are measured biometrically. This software can interface with any payroll system and conducts its own analysis, forecasts shift patterns, productivity and sales. Closed circuit television cameras with intelligent monitoring and high megapixel detail for identification purposes are available. The digital watermark feature ensures that footage cannot be tampered with. Access control such as turnstiles, gate motors and biometric readers with either fingerprint or retinal scanning. Access control units can be linked to time and attendance systems for labour management purposes. 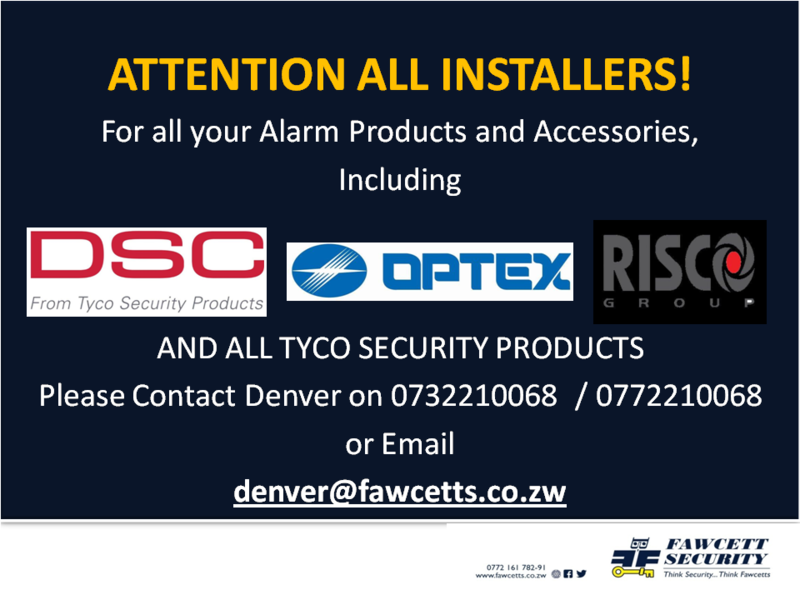 Alarm Systems for indoor and outdoor applications are available. Outdoor systems are effective in security devices because they detect the intruder before entry into the building. Indoor systems will alert the occupant to suspicious movements within the building. Back-up to deal with the intrusion. A security presence until a guard can be deployed to secure the area, should the occupant require this. Access to the Fire Brigade, Ambulance Service and ZRP if their presence is required. Panic units can be installed as stand alone units or incorporated as part of an alarm system. Customers have the option of mobile or fixed units or a combination of both. Remote panic units covering distances of up to 400m in radius are available. Panic units can be integrated with electric gates, lazy man doors and alarm systems meaning that only one remote is required.